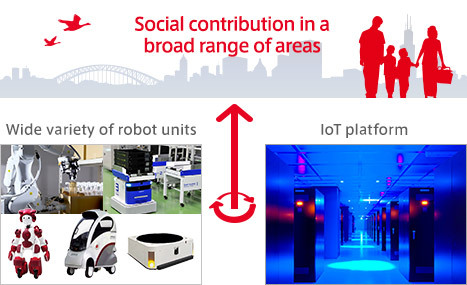 Hitachi develops a wide variety of robots integrated with an IoT platform to improve people’s lives. IoT has accelerated co-creation between companies and has helped create new value. But in order to leverage the full potential of IoT, data processing must go beyond cyberspace. New and innovative services in the real world will depend on our ability to combine data with physical operations. That’s why robotics will play such a crucial role moving forward, as they become our bridge between the real and virtual worlds. At Hitachi, we’ve developed a wide range of robots for various applications by leveraging our expertise in operational technologies (OT). But we’re not developing technologies without reason. We’re implementing social innovation. By integrating robots with IoT platforms, and using that technology in social infrastructures, we’re actively promoting initiatives to improve people’s lives. EMIEW3 is a human symbiotic robot that aggregates data obtained from various external sensors. Information necessary for providing services is then processed over a cloud-based robotics IT platform and fed back to the robot – helping it navigate, communicate, and interact with its surroundings. This IT infrastructure can also be integrated with existing operational systems to provide business intelligence by processing various kinds of relevant information. We also offer business solutions with interconnected robots. At Hitachi, we’ve been developing robotics technology for over half a century, while focusing on co-creation with clients to generate new value. 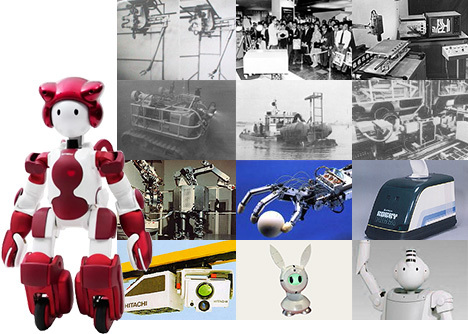 The history of Hitachi Group’s robotics dates back to the 1960s with our Servo-Manipulator, a remote controlled device for nuclear power plant operations.Since then, Hitachi has introduced a wide variety of robots – from mechatronic products, such as semiconductor testing equipment and financial devices, to robots for extreme environments like nuclear power plants. With Hitachi’s R&D focusing on the development of automatic control and intelligent processing, our advanced robotics has served as the vehicle bringing these technologies to life.In 2005, Hitachi became one of the first companies to develop a human symbiotic robot. Rolling out improved functions in phases with new elemental technologies, by 2016 Hitachi proudly introduced EMIEW3, a service-assistance robot that can talk and work with people. We’re also focusing on co-creation with clients to generate new value. Currently, we’re actively setting up new facilities for conducting demonstration experiments, with multiple collaborative spaces already in operation to implement high-quality prototyping alongside our clients. The proliferation of IoT in recent years has seen a wide array of information and knowledge stored in cyberspace. This shift has also made real-world applications of digital solutions increasingly realistic through robotics. As we develop robotics solutions for the age of IoT, we’ll continue to drive social innovation forward, solving today’s challenges for a better future. that offer new value to customers. EMIEW3 draws from Hitachi’s extensive expertise in robotics and digital solutions to realize a high level of autonomy. A cloud-based IT infrastructure serves as a “remote brain”, which monitors and controls the robot’s body. This brain connected with the robot’s body in real time also gives EMIEW3 the ability to communicate, navigate through its surroundings, and provide customer support and guidance.By accurately understanding situations in various service settings, EMIEW3 is able to recognize and approach those in need. It can even start up a conversation on its own to provide services — improving user satisfaction and business efficiency. *For the practical application,EMIEW3 is conducting a demonstration test. ROPITS is a single-passenger mobility support robot that features autonomous transportation. ROPITS can be summoned easily from anywhere in the city using a map on a mobile information device. Once summoned, ROPITS autonomously travels to the designated point to pick up and transport passengers to their destination. It automatically avoids obstacles through a 3D environmental recognition technology integrating multiple sensors. It also has active suspensions mounted onboard, which give it stability even on winding or uneven paths. We expect ROPITS to help the elderly and those with difficulty walking to support short-distance trips. *For the practical application,ROPITS is conducting a demonstration test. Consumer needs are becoming increasingly diversified, and logistics is becoming even more complex as a result. While these trends are giving rise to a demand for more streamlined warehouse operations, current automation equipment can only be used for certain types of products and work, which limits their application.At Hitachi, we’ve developed an autonomous mobile dual arm robot that opens new opportunities for warehouses. Equipped with two commercially sold industrial arms, this robot comes with an elevating platform mounted on a travelling truck to enable height adjustments. 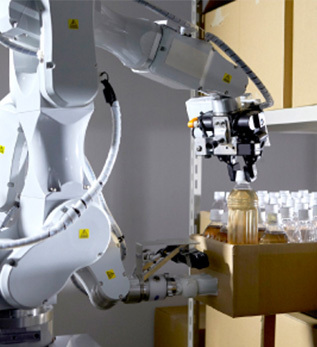 It also includes a gripper that automates manual operations, such as pulling out shelves and picking out products.The dual arm robot uses built-in sensors to understand its own position and the location of products that need to be picked. While in motion, it can also identify specific products before picking them out from the shelves.But there’s more to this robot than order picking. With its dual arms, this advanced technology can also complete complex tasks that require coordination between two arms.With the advancement of our automation technologies, the future of logistics is closer than ever. *The autonomous mobile dual arm robot is still in its development stages and it is yet to be determined when it will be put to practical use.